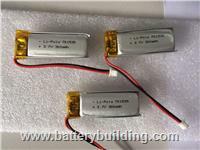 ﻿ 701535 300mah li-polymer rechargeable battery cell. 701535 300mah li-polymer rechargeable battery cell. Product Name: 701535 300mah li-polymer rechargeable battery cell. 3.7V 300mah 701535 lipo battery Size: 7.0*15*35mm Capacity: 300mah Cycle life: 500 times. Lead time: 7-15 working days after the order is confirmed. OEM/ODM Service available, After-sales service. Fully charged @1C to 4.2V for 2.5 hrs, then discharge to 3.0V @ 0.2C. Please feel free to contact us to get more details, we are always here to support you!